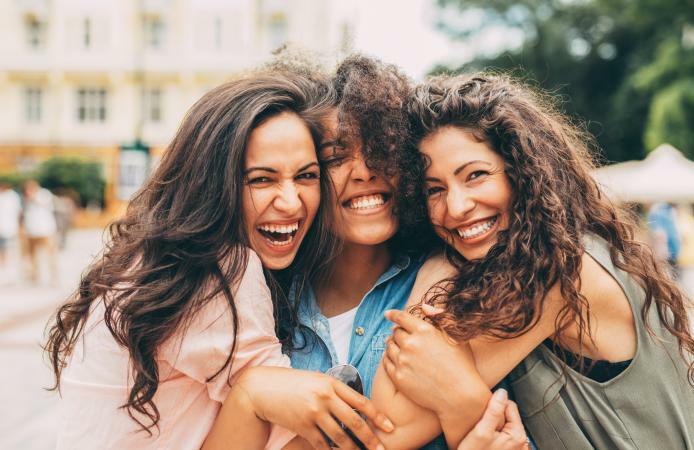 Using cute friend quotes or sayings in texts, Instagram messages, emails, or cards to your best friends can add that special touch that reminds them of just how much they mean to you in a fun, lighthearted way. These quotes provide some of the best adorable, yet poignant, sentiments about true friendship that are perfect for sharing. 1. "A friend is one who knows us, but loves us anyway." Fr. Cummings' quote shows that above all, friends can accept one another, flaws and all. This cute and humorous quote made the list of Quotabulary's top funny friendship quotes. This can be a good quote to add to a thank you message or card to show your appreciation for your friend's loyalty. 2. "Walking with a friend in the dark is better than walking alone in the light." Even though Helen Keller lost her hearing and sight at a young age, she didn't lose her insight. This quote also underlines her sense of humor. This is named one of the top 12 Helen Keller quotes according to The Christian Science Monitor, and it's the perfect sentiment to share with a BFF. 3. "There is nothing better than a friend, unless it is a friend with chocolate." Named one of the top cute friendship quotes according to Country Living Magazine, this lighthearted quote is a reminder of how sweet a great friendship can be - and how the best things in life are always better with chocolate. Use this quote along with a sweet treat to thank a friend or celebrate her birthday. 4. "Friends are the bacon bits in the salad bowl of life." This fun quote is listed among the compilation of Best Thoughts and Quotes of the World by Shashikant Nishant Sharma, and it is a humorous yet endearing one. Use this on an invitation to invite your bestie out for lunch, or just to make her smile. Deemed one of the best cute quotes to sum up a great great friendship by Marie Claire, this quote focuses on the strong impact and impression a true friend can have on your life. This is a great one to use to cheer up a friend and brighten his day. This adorable quote made the list of Quote Ambition's most inspiring best friend quotes, and it's one that's too true. Finding a real friend that sticks by your side can be hard, and once you find that person, you realize how fortunate you are to have him or her in your life. Send a text or message with this quote just to let your friend know you're thinking of her. This fun celebrity friendship quote is on Brainy Quote's page of best friend quotes, and it's not only a sweet sentiment that captures just how you might feel about your best friend, but it also expresses the bond between two people who are always there for each other. The words of the poet William Blake are a good reminder of just how important friendship is. It's an integral part of human life that can make life richer, fuller, and more meaningful. It has a place among the list of top short friendship quotes according to Quotes Plant. This is a quote that's great to share with a good guy friend. 9. "A day without a friend is like a pot without a single drop of honey left inside." A.A. Milne shares a thing or two about the ups and downs of friendships in the classic and beloved The Complete Tales of Winnie the Pooh. This quote from the honey-loving bear reveals the sweetness and happiness friendship can bring. It also makes the Wisdom Quotes list of best friendship quotes. 10. “True friends are always together in spirit." One of the themes L.M. Montgomery's Anne of Green Gables series explores is friendship and having a friend who is a kindred spirit can help you get through anything. This is among the top friendship quotes on Good Reads. This sweet quote is a good one to use if your friend is going on a trip or you'll be apart for a period.